Who Rules The Tech World? Girl Scouts! At Girl Scouts, we know the only thing a girl needs to make her dreams come true is opportunity, which is why we are committed to making sure Girl Scouts—and all girls—have access to the most accomplished, most inspiring people in all fields. 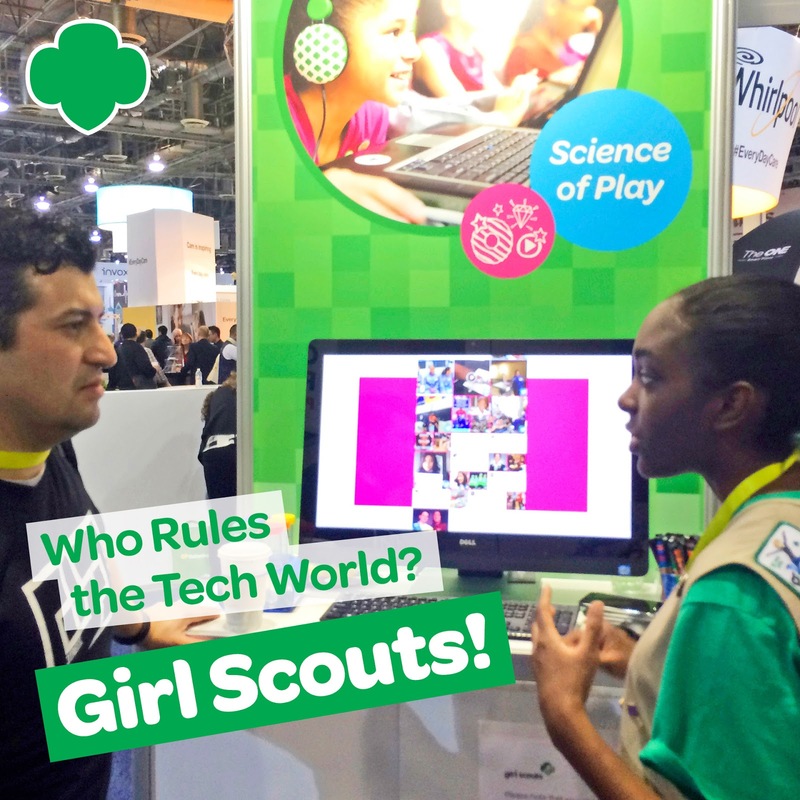 Recently, Girl Scouts had a chance to meet with top STEM professionals at the Girl Scouts’ #genSTEMgirls booth at this year’s Consumer Electronics Show (CES) and learn all about robots, 3D printing, and the doors that open to you when you learn how to code. Even more exciting? Blandine’s innovative company, which makes robots that people can use in their everyday lives, actively wants more girls and women to join their ranks. “We want females to join because we know having a more diverse workforce is good for everybody,” she said. “It encourages creativity, gives you more ideas, and different ways of looking at problems. I could go on forever!” For even more on how Blandine has made it big in the tech world, watch the whole interview here! In the male-dominated tech world, it’s a woman—specifically Girl Scout alumna Olivia Sterns—that our country depends on to learn about the latest in computing, gadgets, and technological innovations. As NBC Tech Correspondent, Olivia has become the authority when it comes to translating computer code into language even your grandfather could understand, and she’s eager to share her passions and inspire today’s girls to follow their dreams. Mallika had the opportunity to chat one-on-one with Olivia, and learn her secrets for success—but we don’t want the wisdom to end there! Check out Mallika and Olivia’s inspiring conversation here and share it with the girls in your life. When you commit to saying, “I want to be an expert in this field,” as Olivia suggests, there’s no limit to what you can accomplish! Buzz Baldwin, Co-Founder of 3D Printlife, an environmentally-conscious 3D printing company, was also eager to chat with Girl Scouts at CES, and ended up having a super interesting conversation with Girl Scout Athena about the many ways 3D printing can be used in every industry from bath and body products to aerospace. “Obviously men and women are equal,” Buzz said, “but girls I think sometimes approach problems differently than men do—I think they see things in a way we don’t. So it’s really important that girls are involved in science and technology going forward.” Get more inspiration and from Buzz by checking out Athena’s awesome interview. Being a Girl Scout helped teach Kate Drane learn that she had the capacity to learn and do anything she set her mind to. Today, as the Senior Director of Outreach for Technology and Hardware at Indiegogo, she helps make bold, innovative tech ideas come to life. Girl Scout Lila got a chance to speak with her and learn more about that process. For further insights into the tech world, check out more videos here!